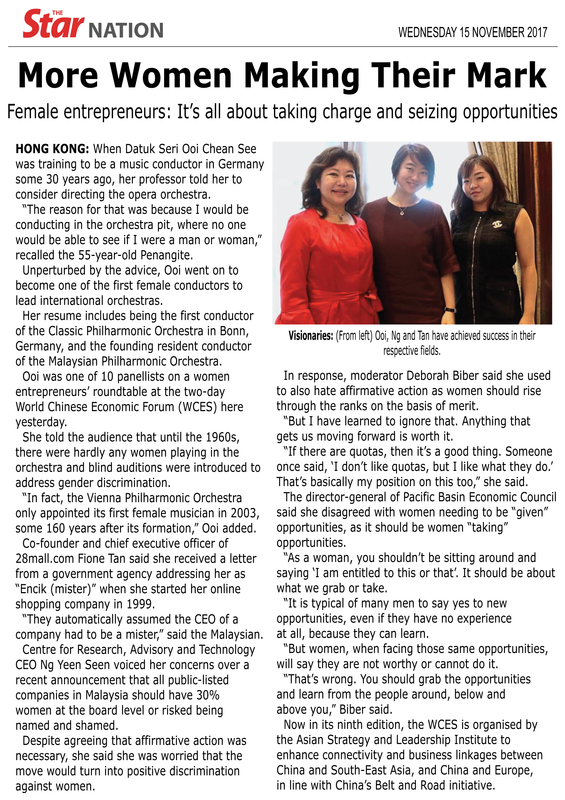 HONG KONG: When Datuk Seri Ooi Chean See was training to be a music conductor in Germany some 30 years ago, her professor told her to consider directing the opera orchestra. “The reason for that was because I would be conducting in the orchestra pit, where no one would be able to see if I were a man or woman,” recalled the 55-year-old Penangite. Unperturbed by the advice, Ooi went on to become one of the first female conductors to lead international orchestras. Her resume includes being the first conductor of the Classic Philharmonic Orchestra in Bonn, Germany, and the founding resident conductor of the Malaysian Philharmonic Orchestra. Ooi was one of 10 panellists on a women entrepreneurs’ roundtable at the two-day World Chinese Econ­omic Forum (WCES) here yesterday. She told the audience that until the 1960s, there were hardly any women playing in the orchestra and blind auditions were introduced to address gender discrimination. “In fact, the Vienna Philharmonic Orchestra only appointed its first female musician in 2003, some 160 years after its formation,” Ooi added. Co-founder and chief executive officer of 28mall.com Fione Tan said she received a letter from a government agency addressing her as “Encik (mister)” when she started her online shopping company in 1999. “They automatically assumed the CEO of a company had to be a mister,” said the Malaysian. Centre for Research, Advisory and Technology CEO Ng Yeen Seen voiced her concerns over a recent announcement that all public-listed companies in Malaysia should have 30% women at the board level or risked being named and shamed. Despite agreeing that affirmative action was necessary, she said she was worried that the move would turn into positive discrimination against women. In response, moderator Deborah Biber said she used to also hate affirmative action as women should rise through the ranks on the basis of merit. “But I have learned to ignore that. Anything that gets us moving forward is worth it. “If there are quotas, then it’s a good thing. Someone once said, ‘I don’t like quotas, but I like what they do.’ That’s basically my position on this too,” she said. The director-general of Pacific Basin Economic Council said she disagreed with women needing to be “given” opportunities, as it should be women “taking” opportunities. “As a woman, you shouldn’t be sitting around and saying ‘I am entitled to this or that’. It should be about what we grab or take. “It is typical of many men to say yes to new opportunities, even if they have no experience at all, because they can learn. “But women, when facing those same opportunities, will say they are not worthy or cannot do it. “That’s wrong. You should grab the opportunities and learn from the people around, below and above you,” Biber said. Now in its ninth edition, the WCES is organised by the Asian Strategy and Leadership Institute to enhance connectivity and business linkages between China and South-East Asia, and China and Europe, in line with China’s Belt and Road initiative.